A bit of time spent in Chile, and you might consider it an outlier amongst its Latin American family. The country runs with German-style efficiency when compared with the rest of the continent, and you might say that a Chilean is uncharacteristically serious when compared to their Colombian or Brazilian counterparts. A walk through Santiago’s financial district feels something like Chicago while the nearby port city Valparaiso would have you taking elevenses (tea is overwhelmingly preferred to coffee) or grabbing a plate of Chilean fish (merluza) and chips. Northern architecture aside, Chile doesn’t really feel as though it was ever a Spanish colony. Puerto Varas and Frutillar in southern Chile feel more like Rothenburg in Bavaria. Finally the developing middle class and its substantially higher level of disposable income are significant factors in the country’s consumer behaviour habits. Retail tissue is well developed in Chile, at per capita consumption of 8.1kg in 2014. This is only slightly below regional average in Western Europe, although still behind the North American average of close to 14 kg per capita. In 2014 Chilean retail tissue saw 1.7% growth in volume terms, which is well below that of the regional 3.3% for Latin America. The away-from-home market, on the other hand, recorded close to 8% growth in volume in 2014. While reflective of stronger opportunities for growth in contrast to retail, away-from-home sector is not without its share of risks. Toilet paper and kitchen towels remain the key categories in Chilean retail tissue, accounting for 90% of retail tissue sales in 2014. Toilet paper in volume terms grows alongside the stagnant population (Chile has the second lowest birth rate in Latin America behind Cuba), although there is still much room to cover within kitchen towels if Chile ever wants to match consumption rates in the US. 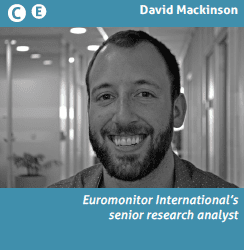 Lower consumption of facial tissue, compared to North America and Western Europe, also suggest potential for further growth within the category. The tissue market in Chile continues to be dominated by the local giant CMPC, which has never seen its share in value drop below 70%. The leading brand in toilet paper, Confort, is synonymous with the product in Chile, while a kitchen towel is more commonly referred to as a “toalla Nova”, Nova being the CMPC brand and market leader. The company has actively invested in value-added options for its existing brand portfolio, rolling out Nova Evolution (greater absorption) in 2014. Confort odour control toilet paper is interesting due to the limits of Chilean piping (toilet paper is often discarded in waste baskets). Confort wet toilet paper represents less than 1% of the market. However, it illustrates how far the company has to go to squeeze value out of the market. The company also seeks to increase facial tissue appeal to consumers through the additional of fragrances. The CMPC Tissue brand Elite Aromas offers pocket handkerchiefs with added fragrances, such as vanilla, coconut, apple and others. Elite boxed facial tissues has added Aloe vera and vitamin E variants, as well as menthol. Growth opportunities for CMPC have been explored on the other side of the Andes as well. The company is active within eight countries in Latin America (including Brazil and Mexico) but has encountered more adverse environments in Colombia, Brazil, and Mexico thanks to the presence of SCA, Santher and Kimberly-Clark, respectively. Where else might a Latin tissue producer look to for growth? An outlying characteristic of Chile is that of its relative economic and political stability. Regional giants Brazil, Argentina, and Venezuela will all be in the red in 2015, and even though growth will be strongest in Colombia, Chile has had the benefit of more than a decade of mostly interrupted progress. This type of economic stability and consumer confidence has allowed businesses of all stripes to outsource their tissue needs. 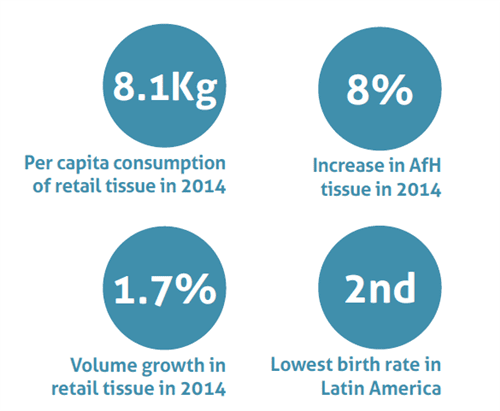 AfH tissue in Chile increased by 8% in 2014, while in current value terms sales grew 13% (in local currency). The market leader CMPC is pressing higher quality, more efficient products that actually encourage lower rates of usage in volume terms. Positive volume growth is also due to the aggressive sales campaigns being undertaken by the leading companies in the category. The prospective AfH tissue client in 2015 is no longer a large operation with at least 100 employees, but rather much smaller businesses and offices which employ fewer than 50 or even 25 people. However, this opportunity in the AfH market comes with its own set of risks. Smaller businesses are often more acutely aware of budget constraints, and fixed contracts for toilet paper, kitchen towels and napkins might be considered a deal breaker for a small business trying to cut costs. The Chilean economy experienced a de-acceleration in the third and fourth quarters of 2014 and consumer confidence saw its lowest rates since the global financial crisis in 2009. This presented an opening for the more economical Chinese brands that have begun to enter the Chilean market. Subsequently, growth in value in 2014 was constrained due to a nearly 2% drop in the average price of AfH tissue. Current strategy for the companies involved in AfH tissue and hygiene in Chile is to offer diverse product portfolios in order to meet the needs of a wide range of different clients. For example, CMPC Tissue offers Elite Maxwipe, paper towels designed for very specific industrial uses such as absorbing lubricants, oils and solvents. Papeles Industriales also targets the economy and premium end of the away-from-home price spectrum. It leads innovation in terms of design with its Tork line, which features a range of dispensers for soap, toilet paper and paper towels. Food processing plants are a primary focus for Kimberly-Clark Chile. The company is focused on the specific needs of this industry with a range of products including paper towels, dispensers and soap. The overall growth in retail tissue in Chile is set to continue at a modest 1% CAGR in volume terms through 2019, with fairly mature toilet paper recording the lowest rate of growth. Somewhat less developed, compared to toilet paper, kitchen towels, paper tableware and facial tissue are set to see a better performance. We can expect the principal players to continue to invest in value-added options as well as the development of new areas in a bid to boost sales. Companies should concentrate their efforts on developing new distribution channels as well as on diversifying their portfolio to include a full range of pricing options, given the inevitable entry and expansion of more economy level players. Anticipated improvements in Chile’s economy are likely to encourage small businesses to not only outsource their tissue needs, but to invest in high-quality products and premium variants. We can expect tissue players to continue directing more effort towards their AfH product development as this is one of the few remaining areas for double digit growth rates in value terms. The level of maturity of the tissue market in Chile marks it as an outlier within the region but opportunities for growth within AfH are ripe throughout the region. Leading players should leverage their brand recognition into something more than just success in the retail market. Economic factors will continue to cause uncertainty in the region, especially within the AfH market, but we can be certain that Latinos will need as much tissue this year as they have at any time in the past. Share the post "Tissue marketplace in Chile: maturing retail and opportunities in away-from-home sales"